Pretty Things: Bead Soup Blog Party is HERE! The first Bead Soup Blog Party was a huge success, and I received a lot of emails requesting another one. So here it is! 1. Email me your name, blog address, and mailing address. DEADLINE is May 7th! 2. Grab this button for your blog and link it back to this post. This post will be where all the blog links of the party-goers will be. 3. Be prepared to send a focal, a special clasp, and a small assortment of coordinating beads to your bead swap partner (sent by May 18th). 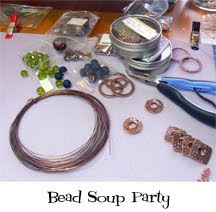 Examples can be seen by clicking here and viewing the Bead Soup Party Flickr stream. 4. Party Week starts June 19th. Last party, we had so many attendees that we really needed several days to visit all the blogs and view all the loveliness, so this time we'll split the party into days. I'm still recovering from surgery, so give me 24 hours to reply to you -- if you haven't heard back from me by then, email me or leave me a comment again or check your spam mail. 25. Lois, Que Onda Q'town? Lori, the 1st event was such a blast. I'm sad I won't be able to participate this time around. I can't wait to see the creations in Round 2! please count me in on bead soup ..the last one was so much fun...can't wait to see who my partner will be this time around. I'm definitely in again! Squee! and please take of yourself. around! Thanks again Lori...can't wait! I am ready to party. Thank you for organizing it again, it was so much fun and you did a great job. Get well soon. Sounds like you will all have lots of fun! I hope things are looking up for you. I just e-mailed you. I had so much fun last time, i can't resist joining again this time! Oh I so wanted to do this again, but it is at the time where I am teaching, AND getting ready for Bead and Button. So sad. Have a great time eveyone. Oh, I wish I could! I had such a blast in the first party, but I'm in cram mode for Bead & Button, so I'll have to pass. :o( Next time, though, for sure! this looks so cool! how wonderful the blog-world is, no? Looking forward to the party. Count me in! I am gettin my soup on this time! 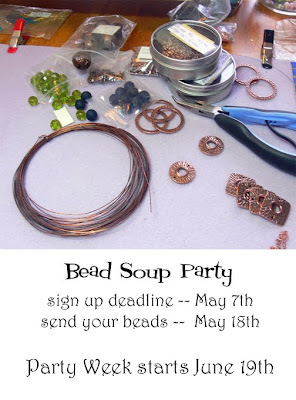 Just stumbled onto your blog and I would love to join the "Bead Soup Blog Party". However I'm from The Netherlands so hopefully that's ok. I just emailed you. The party sounds fabulous. I can't wait to attend. Thank you for putting it together! I found out about the party via Juls and would love to take part. I am in Australia though so I hope that is ok? I signed up, too! I can't wait! I'm in! I just sent you an email and posted a link on my blog. I'm stoked! Lets get to it. I can't believe I missed it this time! Bah humbug! Next time ... you are doing another one, right?!!! Missed this one, can't wait to see the reveals! I would love to participate in a bead soup party, but postage, back and forth from here to the US, would eat up too much time. Would it be ok if I did my own party here in Sweden? 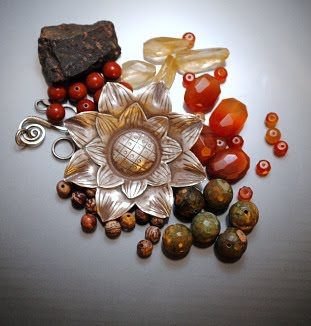 Maybe I can get some Swedish jewellery-bloggers interested in having a bead-soup party. I think Lotta Knutar of Silverknuten did it once last year. I am following your party and learning! I enjoyed checking out all the blogs last time! Looking forward to doing the same this time! You did a good job, Lori! :) No wonder many people who like your artwork. Amazing! Brilliant website, I had not noticed lorianderson.blogspot.com previously during my searches! It seems many people very excited by this Bead Soup Blog party. I see many talented designer there. So, good luck for your next project, Lori!